The course is free. Sign up today! Discover what is behind the exercises as you prepare to engage in Sensory Enrichment Therapy. A detailed guided tour through this cutting edge, clinically proven sensory approach. On your phone, tablet, or computer, sit back and enjoy. As you consider Sensory Enrichment Therapy as an option for your children, we present you with an opportunity to study the program in detail and in-depth with training material taken from the professional certification course. The course includes 2 hours of detailed information about the science that forms the basis of this therapy, an analysis of a few powerful protocols and an in-depth description of the tools you will be using as you implement the therapy in your home. This course is possibly the best way to prepare to administer this program with your child. Sensory Enrichment Therapy is a new sensory modality that targets the mechanisms of brain plasticity to improve brain functioning. As a parent, this course will help improve your confidence and understanding while delivering Sensory Enrichment Therapy to your loved one. This course is provided completely online. You can take the course using your own computer or mobile device. This course does not certify you to deliver any therapy support to anyone else and does not give you any privileges as a certified professional in any way. It does not provide all of the information necessary to engage in the therapy, as an account on Mendability is required for the actual assessments, worksheets, and instructions. Note: If you are a health professional and would like to become certified in Sensory Enrichment Therapy, please enroll in the Professional Certification Course available on this site. Development of Sensory Enrichment Therapy …… 23 min. How the science of environmental enrichment was developed into a practical therapy. 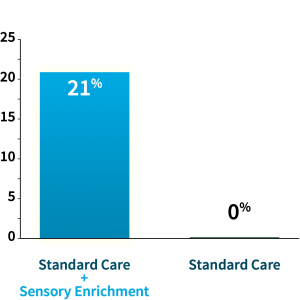 Sensory Enrichment Therapy Principles …… 27 min. How to do Sensory Enrichment Therapy at home effectively. Baseline Questionnaire …… 15 min. How to complete the initial evaluation form. Progress Questionnaire …… 9 min. How to report progress in order to get the most beneficial worksheets. Where you review the instructions for the therapy exercises. Multisensory Core Protocol …… 20 min. Description of the Multisensory Core Protocol and commonly asked questions about olfactory, tactile and visual activities. Sensory Enrichment Foundation …… 13 min. How to incorporate short sensory pairings into existing daily routines to provide additional opportunities for brain development throughout the day and multiply the effects of the therapy activities. What progress looks like with Sensory Enrichment Therapy …… 8 min. What to expect with the program. Brain Map – Part 1 …… 23 min. Brain Map – Part 2 …… 29 min. Key roles, functions, and physiology of the brain as it relates to Sensory Enrichment Therapy. Brain Chemistry …… 12 min. How neurons communicate and the impact of brain chemistry on development and behavior. Brain Plasticity …… 12 min. The tools the brain uses to grow and repair itself. Environmental Enrichment …… 17 min. The animal experiments that led to the development of Sensory Enrichment Therapy. Expert System …… 9 min. 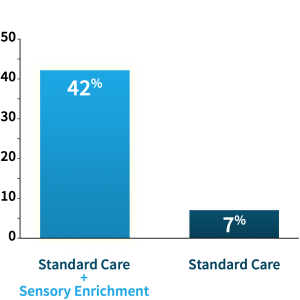 How the expert system selects the best Sensory Enrichment Therapy protocols. How to set therapeutic objectives with the program. Self-Support Tools …… 11 min. The various features of Mendability designed to help you do the therapy at home. The core content should take around 2 hours to complete. There is also 2 hours of optional bonus material. You can take the course at your own pace. There is no time limit. This training will be 100% online but, you still have the option to call us with any questions. Within the online content, there will be visual slides presenting text summaries, data, charts, animations, and videos. The course content will also be narrated to aid audio learners. In addition, there will be text-based content to accompany all of the material. This course was built on the Moodle platform that displays quite well on a mobile device. Do I need to take a test after this course? There are a few quizzes in this course to help consolidate what you learned in order to receive your certification of completion. If you are not interested in the certificate of completion, the quizzes are not required. Sensory Enrichment Therapy is a wonderful treatment model. It has been validated as a very effective therapy in clinical trials with 1,000’s of individuals. Now is the time to make it as easy as possible for you to learn about it and implement it in your home. The course itself is free. What is not free is the cost of working with a dedicated therapist as you implement the therapy in your home if you decide to enroll with Mendability or with one of our certified partners. However, there is no obligation to sign up for the therapy program. We are happy to offer this training and to spread awareness about this new clinically proven modality. The cost of the course listed on this web page includes everything you need to learn the materials presented. If you are interested in implementing Sensory Enrichment Therapy in your home, you will need to either enrol separately with Mendability or any other health professionals certified in Sensory Enrichment Therapy. If you are currently enrolled in Mendability, you may be eligible to take the course free of charge. Please contact us for more details. Do I have to be enrolled in Mendability to take this course? No, you do not need to be enrolled in any Mendability program in order to take this course. What will this course allow me to do? This course is for educational purposes only. It is designed for parents and caregivers who are interested in learning about Sensory Enrichment Therapy. This course includes a few examples of protocols that are assigned to families to implement the full program in their homes. While they are powerful in their own right, we do not endorse the application of these protocols without the supervision of a certified professional in Sensory Enrichment Therapy. If you are a health professional interested in becoming certified, we recommend that you enrol in the professional certification program.